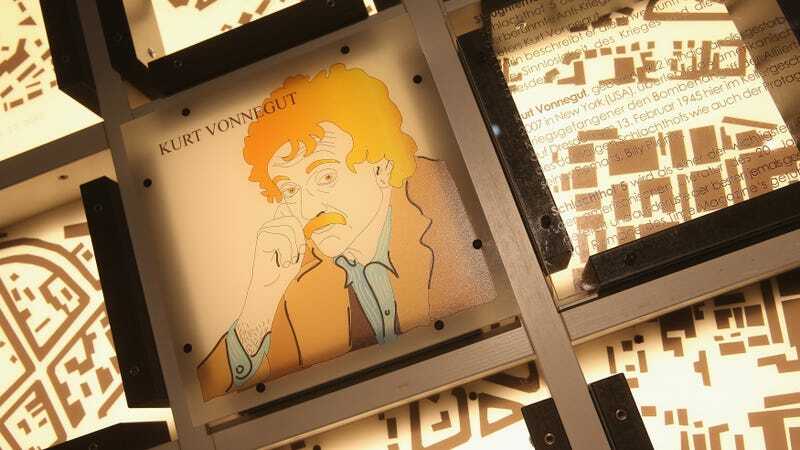 First up: Variety reports that Kurt Vonnegut’s beloved novel of war and empathy, Slaughterhouse-Five, will soon be landing at Epix (it’s a cable network), with a TV version of the book currently in the works. We reported on the original plans for a televised take on Vonnegut’s classic last year, but now we know that Universal Cable Productions will be developing the show for the screen for Epix. A second Psych movie is still in the works, according to the USA comedy’s fake clairvoyant. Promoting ABC’s upcoming drama A Million Little Pieces at the Television Critics Association summer press tour, Psych star James Roday told reporters “We’ll figure out a way to do” the follow-up to last year’s Christmas-themed Psych: The Movie. It’s been reported that Roday’s role on A Million Little Pieces and co-star Dulé Hill’s commitment to Suits have delayed the sequel’s production; at the TCAs, Roday cited another cast member as a reason to return to the psychic PI game: “We gotta get Tim Omundson back to his Psych-os.” Omundson’s screentime in Psych: The Movie was limited due to a minor stroke he suffered in 2017. Netflix’s upcoming Stephen King and Joe Hill adaptation, In The Tall Grass, has just added Patrick Wilson to the cast. Per Deadline, Cube director Vincenzo Natali is helming the film, based on a short story about children who are in the corn, if not necessarily of it. Meanwhile, Wilson is currently set to co-star in the upcoming Aquaman. Damon Lindelof’s Watchmen TV series is apparently just going to keep on casting people until there’s nobody left; Deadline reports that three more actors have joined the production, all in unnamed roles, because Lindelof can’t even give us that much, we guess. Dylan Schombing, Adelynn Spoon, and Lily Rose Smith—all child actors—have now joined the cast, along with the rest of the planet. Meanwhile, we’re still waiting for the call, presumably to play a bunch of pop culture writers who are sick of all the casting news pouring out of some popular pirate TV show in the series’ alternate universe setting. John Carpenter’s The Fog will be settling back over theaters in a couple of months; Variety reports that a recently remastered version of the Adrienne Barbeau-starrer will dip into a handful of theaters on October 26. For anyone struggling to remember, we’d like to remind you that The Fog is not: The Mist: The Short Story, The Mist: The Movie, or The Mist: The TV Show. We hope this clarifies any confusion you might have had; it is, instead, The Fog. The film will run in theaters in New York and L.A., plus Chicago’s own Music Box theater. Kelly Clarkson might be getting her own talk show; The Hollywood Reporter notes that the Voice judge is filming a pilot for a syndicated chat program, banking on her now decade-plus run as one of TV music’s most likable presences, and also the fact that we still can’t get “Since U Been Gone” out of our heads. HOT STEVIE NICKS CASTING NEWS: Ryan Murphy has confirmed that the upcoming season of American Horror Story, Apocalypse—which has already been pitched as a sort of grand reunion for many aspects of the long-running franchise—will now include an appearance from the beloved scarf advocate. Murphy tweeted out the news, noting that Lily Rabe, Taissa Farmiga, Gabourey Sidibe, Frances Conroy and Ms. Nicks will all be returning to the show. It’s been 10 years, which means we’re due for another damn American Gladiators reboot. Deadline reports that Seth Rogen is helping to make the push on this one, as MGM is hoping to get America excited about Turbo, Laser, Storm, and the rest of the crew yet again. Contestants will presumably face off against the usual slate of challenges, including Powerball, The Eliminator, and the knowledge that they could have been on American Ninja Warrior instead.